This is one of those recipes that begin with one ingredient and then just come about by thinking what would be good with it, then what would work with two ingredients, with the third, the fourth and so on until you know it’s done. So, I had about 1/2 cup of farro and decided to use it up. I had an open container of vegetable broth, too, so I decided to cook the farro in the broth for extra flavor. I used about 2 cups of broth for the 1/2 cup of farro even though I only needed 1 cup because I would simply drain the extra off and use to make some couscous for a salad. Meanwhile, I cooked 4 breakfast links in a cast iron skillet on medium heat. When the sausage was half done, I added 1/2 can of chickpeas (rinsed and drained). I wanted to use cannellini beans but I didn’t have any. No matter, chickpeas worked great. I added some salt and pepper and added about 1 cup of chopped spinach and just a splash of water, covered with a lid and let the sausage, beans and spinach steam a bit. Meanwhile, I sliced 5 dried plums into strips, added them to the mixture and put the lid back on for a minute. Stirred and mixed everything together. I put the farro in the bottom of my bowl and then spooned the sausage, spinach, beans and dried plums mixture on top. I sprinkled a bit of feta over it and served. Makes a great one-dish single serving meal. The flavors are so wonderful together. The pork sausage and the dried plums are perfect together. 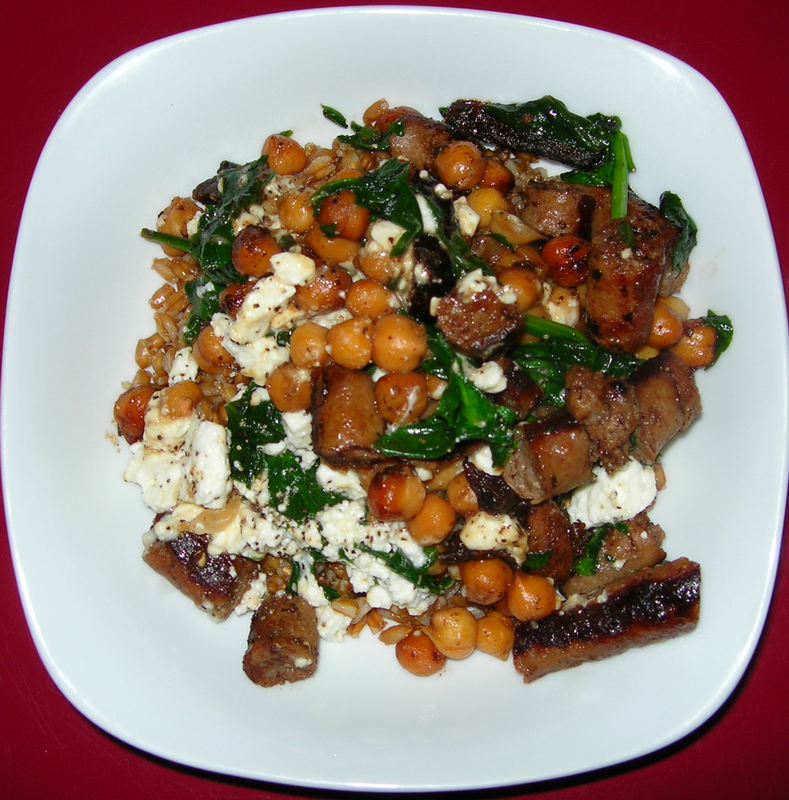 The feta and spinach were made for each other, the farro and beans add a great foundation for these flavors. Cooking the farro in broth gave it a rich flavor to begin crafting the dish. The spiciness of the sausage and the sweetness of the plums meant there was no need for anything other than salt and pepper.